MultiMX (pronounced Multi Mix) – is MXit’s new group chatroom! So you can invite your contacts to join you in a private Group Chat for free! 2. Can only invite people from your contact list (roster) that are online. 3. Only the creator of the room can invite people to join. This has been free since MXit V5.2. So you choose the group name and press Group–Broadcast Write and it will send the message to up to 10 contacts in that group! Basically if you want to chat to more than one of your contacts/friends at a time and you can all talk together at the same time and see what everyone is saying (chat room like), MultiMX will help! It is aimed at being a quick, spur of the moment conversation between a couple of people. – If you log out or deletes the contact, that counts as leaving the MultiMx. – Google Talk or MSN Messenger contacts cannot be part of a MultiMx yet, this feature will still be added. Also, check out “Tradepost” on MXit for more chat rooms where you can chat to more than just your friends list! Tradepost chat rooms work on any phone and you can invite anyone to join your chats! 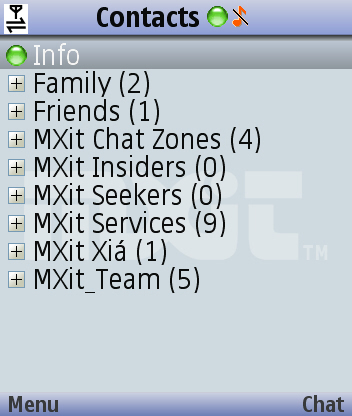 MXit V 5.3 will also have some new bug fixes! MY phone and others i have asked all say that when they try to create it says MulitMX is unavaidable please try again later. And it has done it ever since it came out. Ah, MultiMX had a bit of a problem this weekend! It should be back in action now! Thanks for the heads up 😉 What phone do you use? Im looking for any assistance, the idiot company I work for asked me to do research on Mxit like the Stats and stuff, for advertising. But the I.T department blocked the Mxit website and many others related to mxit except this Blog,and wont open it for me. If anyone can help me get the contact details of the Mxit marketing department or something. Pleeze….. Check out mxitLifeStyle.com for their business site!